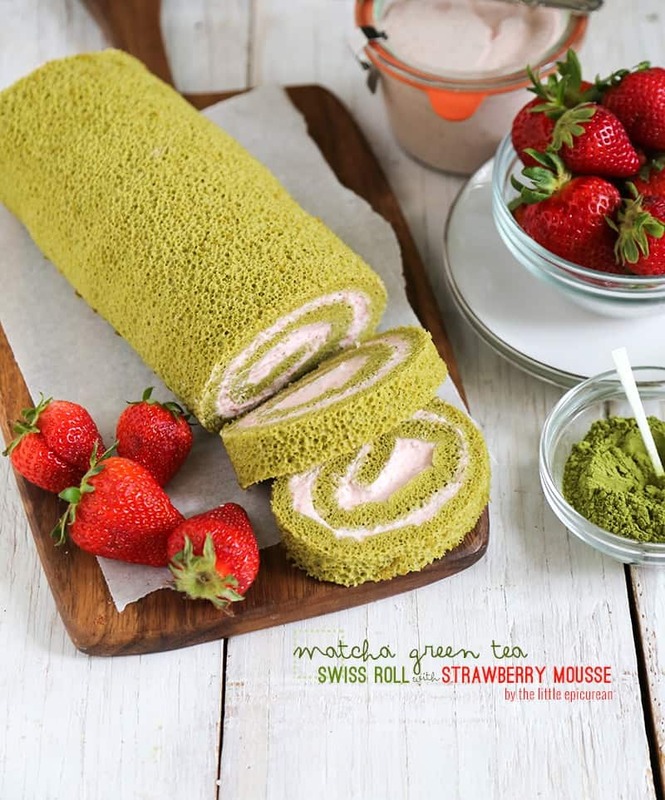 This swiss roll cake combines the slight bitterness of matcha green tea with sweet and light strawberry. It makes for a delicious springtime flavor combination! Alex and I were in full spring cleaning mode this weekend. Cleaning is a task I absolutely hate doing, but it’s something that must be done because I can’t stand living in clutter or mess. The kitchen pantry has been reorganized. Everything now has a proper place. Ingredients are labeled, dated, and accounted for. The living room has been thoroughly vacuumed, the couch is finally aligned with the rug, and even the dining table is clear of junk. But the biggest feat in the house is my prop room (aka the guest room/office). Over the years I have accumulated a lot of plates, bowls, and flatware. Let’s not even talk about the stacks of cookbooks, textbooks, and magazines that fill the guest room’s walk-in closet. While cleaning the prop room, I came across a box of photo albums. Upon opening the first album on top, prop room clean-up came to an abrupt stop. I sat on the couch and looked over all my photos from Japan. I spent the last semester of my undergrad studying in Tokyo. It was a dream come true. I had been interested in Japanese culture since I was a young child. From sushi and tonkatsu to anime and manga, I had grown up fascinated and captivated by everything produced in Japan. I had visited the country once before as a kid with my family. Although we did all the touristy stuff, I still remember it being everything I had envisioned. So, upon my last year of college, I figured I might as well end my carefree days in my dreamland. I had an amazing, memorable time in Japan. It was half a year filled with happy memories and crazy adventures. It’s just too bad that I have forgotten most of the Japanese I had learned. I haven’t been back since. It’s not because I don’t want to- but because I’m afraid of ruining the perfect time I had there 7 years ago. I know it’s a terrible way to think…but I’m working on changing such bad habits (among others). So after finding that photo album, I spent the better half of spring cleaning weekend daydreaming about Japan. The boyfriend and I started scheming up plans of all the places we would visit together in Japan and all the tasty foods we would eat. One day I will go back with Alex. I’m going to brush up on my Japanese and we’re going to explore the rest of the country that I didn’t get to see. I’ve always wanted to go to Hokkaido, Okinawa, and Hakone. And I really want to go back to Osaka to watch a baseball game. We’re gonna go there and I’ll pack away all the memories from college days and create brand new ones. Nothing reminds me more about Japan than cherry blossoms. I’ve been seeing cherry blossoms more often during my recent runs. One of my favorite sweet treats from Japan is matcha green tea and cherry blossom ice cream. Sadly, I don’t have cherry blossom on hand, so I substituted strawberry instead. Green tea and strawberry tastes very good together. 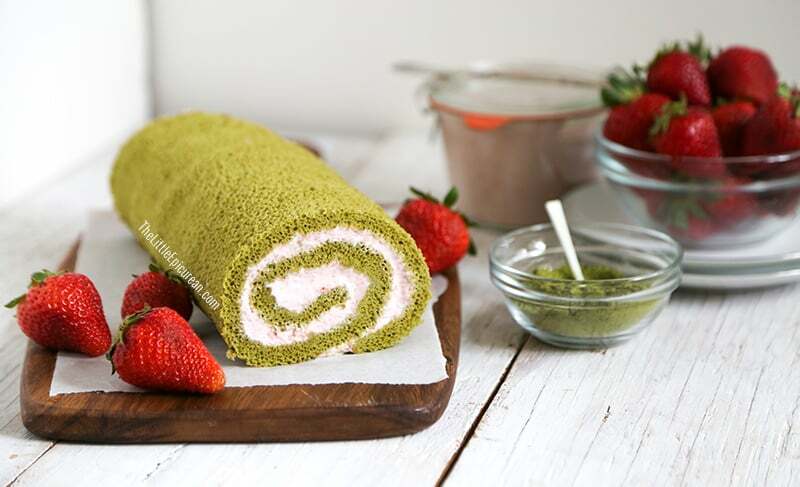 The slight bitterness of the matcha is complemented by the sweet and fresh flavors of the strawberry. Spread cake batter into an even layer on a parchment lined 18×13-inch jelly roll pan. If you have a silpat mat or nonstick silicon baking mat, that would work best. Bake until cake springs back when touched. While the cake is still hot, turn cake over onto a clean kitchen towel. Slowly and gently remove parchment (or silicon baking mat) from cake. Don’t worry if your cake layer ends up looking distorted and destroyed. This part of the cake will be covered with the mousse filling. Use the kitchen towel to roll the cake into a log. Let the cake rest like this until it has cooled to room temperature. Unroll the cake and remove the kitchen towel. Add a generous amount of strawberry mousse filling. Use an offset spatula to spread filling to an even layer. Use your hands to gently roll the cake back into a log. Place the seam at the bottom of the cake to prevent it from unraveling. Cover log with plastic wrap and let chill in the fridge for the mousse to set up. Preheat oven to 400 degrees F. Line jelly roll baking sheet with parchment paper or silpat mat. Set aside. 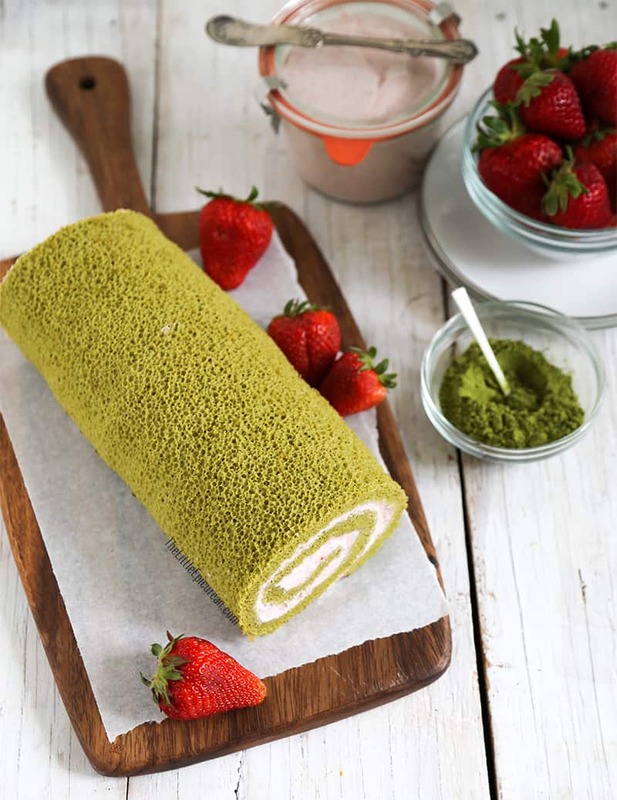 In a small bowl, whisk together cake flour, matcha powder, baking powder, and salt. Set aside. In another clean bowl, whip egg white to medium-stiff peaks. Add dry flour mixture to yolk mixture. Fold to combine. Add whipped eggs in three additions. Gently fold to incorporate egg whites. Pour batter to prepared baking sheet. Use an offset spatula to spread batter into an even layer. Bake for 8-10 minutes until cake springs back to touch. Remove from oven and run a mini offset spatula around the edges of the pan to loosen cake. Invert cake into a clean kitchen towel. Slowly and gently remove parchment (or silpat) from cake. Use the kitchen towel to roll cake into a log. Let the cake rest on a wire rack to cool to room temperature. Once cake is cool, unroll the cake and remove the kitchen towel. Add a generous amount of strawberry mousse filing. Use an offset spatula to spread filling to an even layer. Use your hands to gently roll the cake back into a log. Place the seam at the bottom of the cake to prevent it from unraveling. Cover log with plastic wrap and let chill in the fridge for at least 30 minutes to allow mousse to set up. In a clean bowl, mix together strawberry puree and sugar. Adjust the amount of sugar depending on the sweetness of your strawberries. Take about 1/4 cup of strawberry mixture and place in separate bowl. You will use this for the gelatin. Fill a small bowl of ice cold water to bloom gelatin for about 3 minutes. Squeeze out excess water from gelatin. Place soft gelatin sheets into bowl of reserved strawberry mixture. Microwave mixture 10 seconds at a time until gelatin has melted. Pour mixture into the rest of the strawberry puree. Set aside. Allow mixture to sit and come back to room temperature. In another bowl, whip chilled heavy cream to medium peaks. Add whipped cream to cooled strawberry mixture in three additions. Gently fold cream into mixture. 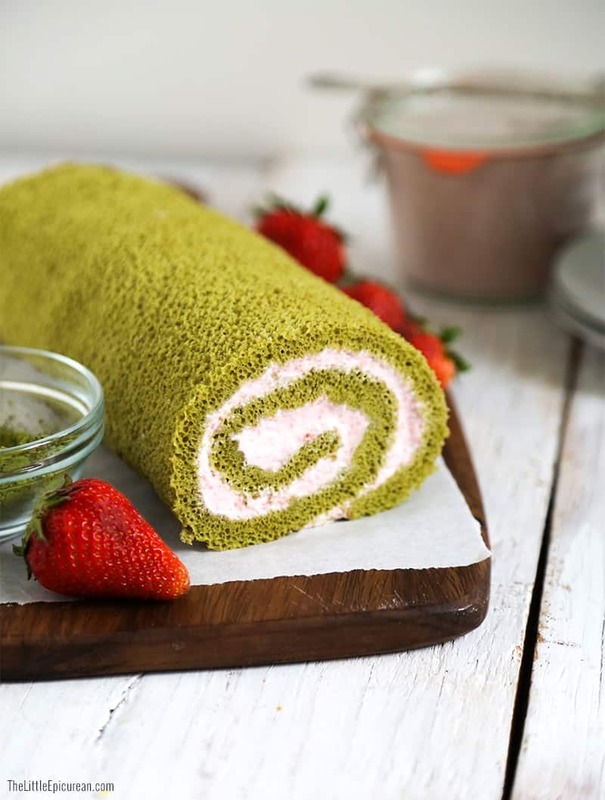 This swiss roll looks very beautiful! 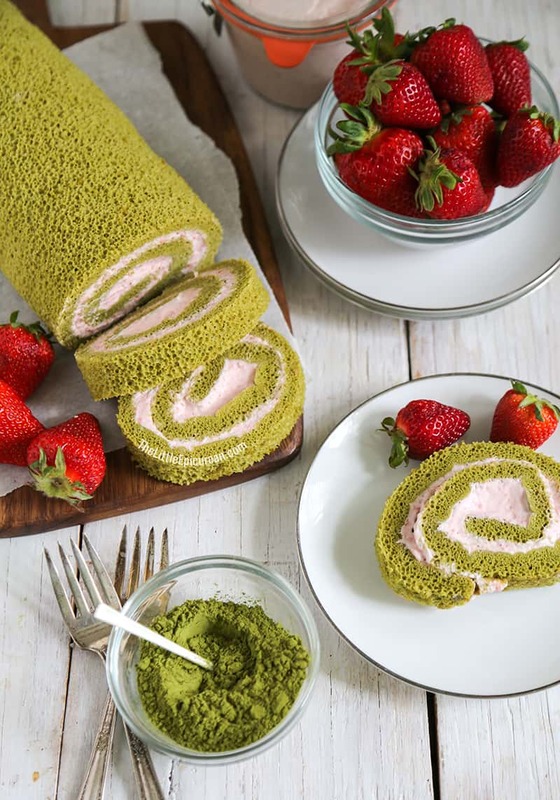 That light pink strawberry mousse must go really well with the green tea. I wish I can have some now. Thanks so much for sharing! Btw, amazing blog! Thanks Ridwan! That means so much :) I can’t wait for you to try it out, too! Wow Maryanne, this looks so great! I really have to make this for my husband, he loves Japanese food and everything Japan. He will love this too, and even though he doesn’t like sweets. btw, are you going to the Ramen Festival this weekend? You have to! Hi Ellen! Thanks!! I’m still thinking about it…I LOVE ramen but I’m afraid it’ll be too crowded. What day are you going? I’m not sure yet, Paulus is coordinating it with our friends. I will text you as soon as I know more! I definitely think it will too crowded, but on the other hand it’s the place to be if you love ramen. And they are serving a ramen burger, we want to try that! This looks delicious! And perfect for spring…where do you buy/ how do you make strawberry puree? Hi Emma, to make strawberry puree you simply put strawberries in a food processor (or blender) and pulse until smooth. look super delish! is there anyway that we can substitute the heavy cream with something else? No, the heavy cream is needed to make whipped cream. It is necessary to make the mousse. I’m sorry, there are no substitutes. That looks super yummy! I don’t have matcha powder on me, but I wonder if cocoa powder would work? Thanks! I haven’t used this recipe with cocoa powder, but I’m pretty sure it would work. Let me know how it goes! I bought matcha Mocafe brand one, it was the very first time I try matcha, and I really felt like I was drinking seaweed :( . Does it has to taste like that? or is it this brand? Hi Michell, I don’t suggest using the Mocafe brand matcha. I would stay far away from it. I’m sorry you had such a terrible introduction to matcha. It’s one of my favorite flavors and it definitely should not taste like seaweed. oh! 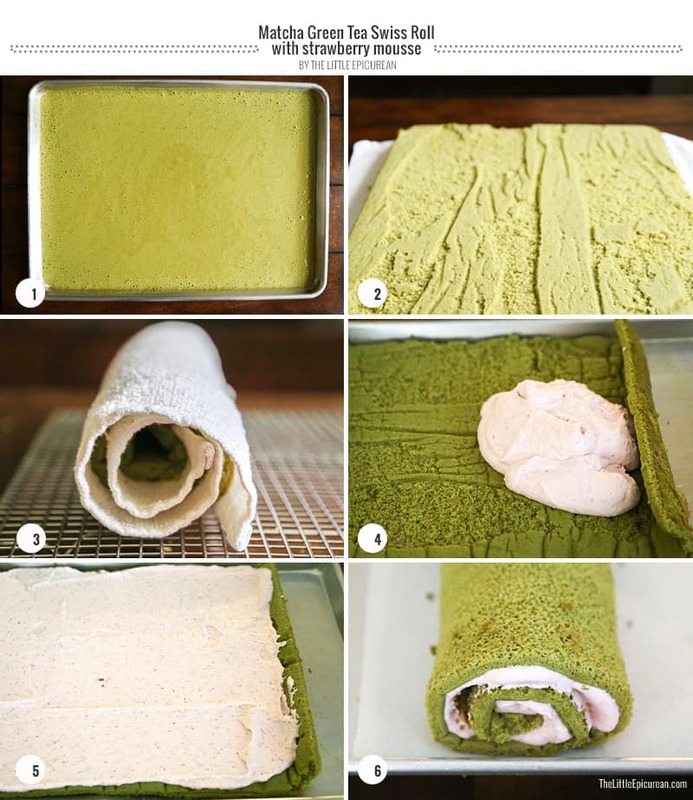 and I wanted to bake something with matcha, then I found your recipe (looks great!!) and i decided not to give up on rolls (I always fail making them) but I’m afraid it taste like seaweed too :s …. I suggest using the matcha brand I have listed in the recipe. It’s pure matcha leaves. Hi! Can I substitute the strawberries with canned peaches? It’s not strawberry season here in our place :( Or would it be better if I used strawberry jam? I wouldn’t substitute canned fruit. They have too much moisture and sugar. If strawberries are not season, you can try using another fresh fruit in its place. I don’t suggest using strawberry jam. It will affect the texture. Hello there. The recipe looks fab. May I know if the gelatine sheet for the mousse is critical as I do not have it at home with me now. If not, I will just have to hold my urges to make it now. Heehee. Thank you. I baked this and it’s very delicious!!! Thanks for trying out the recipe! You can try using gluten-free all-purpose flour like Cup4Cup. How do I replace the gelatin sheets in the strawberry mousse with fruit pectin? I have only tested this recipe with gelatin. You can use agar in place of gelatin, however, I don’t think it will yield the same results with fruit pectin. This is a great recipe. I couldn’t find agar at any stores so I just used a little over a tablespoon of fruit pectin and the mousse seemed to set just fine. Make sure to get the fruit pectin for recipes with less sugar or else your mousse will be sickeningly sweet. Great to hear that it worked! I’ll keep that in mind next time! Your Swiss roll is lovely. Can you please advise me as to how to create so many small bubbles in your sponge. The bubbles are small and lovely. Also the surface of your sponge is bubbly, and there is no ‘Skin’or brown crust on top of your sponge. When beating the egg whites- make sure they are at room temperature. Start beating at low speed until the eggs are foamy. Once foamy, increase speed. This should ensure small, even bubbles.